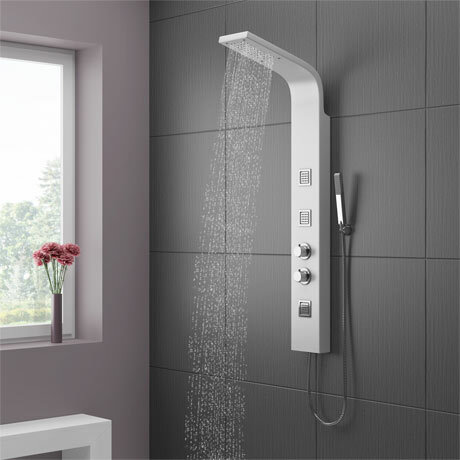 The Maverick Thermostatic Shower Tower Panel features a sleek and contemporary design that offers a sensational showering experience. From our headline Maverick range of luxury panel showers. Includes a main fixed head and a slimline chrome pencil handset for an absolute whole body cleansing. In addition to the shower heads, this extravagant shower panel combines showering with body jets for a soothing massage sensation, and that 'hotel luxury' element in your new bathroom. Q. Is this an electric shower? Hello Liz, no this shower tower isn't electric. Hope this helps! 7 out of 8 found this question helpful. This suite is absolutely beautiful. Love it .